As every rider knows, changing light conditions can cause issues when you are on your bike. The amount of hours we spend on the road can mean starting in the dark and ending in bright sunlight, dealing with waning light conditions in the evening, or quickly changing weather patterns that can turn a bright sunny day on the bike into a dark dreary ride. These situations leave riders with a few, less than desirable options that include carrying more than one set of eye-wear, toting extra lenses if the glasses have exchangeable lenses, or removing the eye-wear when conditions become too dark. The first two options can be an extra headache and the last option leaves they eyes vulnerable to debris, insects, and other airborne objects that could injure the eye. Transitions has been developing lenses for the sunwear business for about 8 years now. Their first partnership was with Oakley and since then they have been working with other partners to incorporate adaptive lenses into their frames. Nike, one of their recent partners, first included Transitions Lenses in their golf sunwear three years ago. They quickly followed up with their outdoor sunglasses. 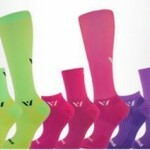 this is the first year for the Nike Speed Tint which was specifically designed for runners but is also recommended for cycling. 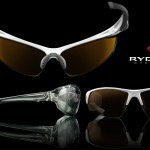 Next year they plan to launch the complete line with prescription lens options as well. 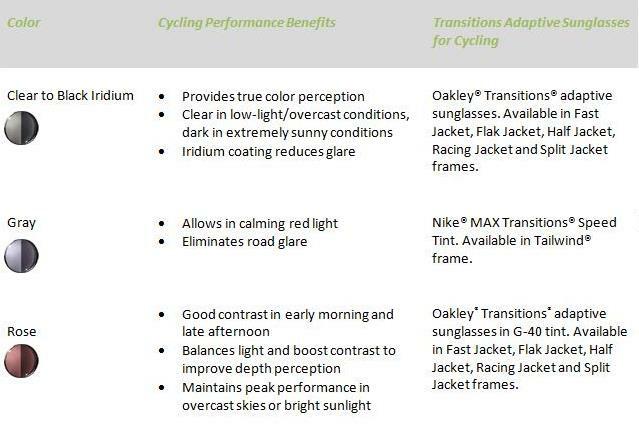 Oakley already offers their sunglasses with prescription Transitions Lenses. Stay with me, because the technology behind Transitions Lenses is not as straightforward as you might think. The Transition Adaptive Lenses contain photochromic molecules; when these molecules are exposed to ultraviolet light, their structure changes. As the intensity of the sunlight increases, the lenses respond by darkening to accommodate the brighter light conditions. This tends to make you believe that more sunlight=darker tint and less sunlight=clearer lenses which, as the user sees it, is exactly how they perform. However, the photochromic molecules are also subject to thermal dependency (creating some performance issues I will discuss later), which means they are also affected by the air temperature. So, while the UV rays are causing the molecules to make the lenses darker, hot summer temperatures have the opposite effect and will actually prevent the lenses from obtaining their darkest tint. Conversely, cold temperatures significantly improve the dark tint of the lenses but will also slow down the process of clearing back up. Having used these lenses during some hot weather rides and now, testing them out in cold weather I have found they obtain a significantly darker tint in the cold weather than they ever did on warm-weather rides. In direct sunlight during cold weather, the Transitions Lenses (top) achieve their darkest tint. 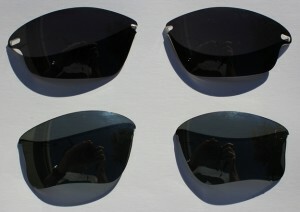 Non-Transitions Black Iridium lenses are on the bottom for comparison. There is a life-span for the photochromic cells, the more you wear and activate them, the faster they wear out. However, they should last the normal life-span of your sunglasses so by the time the lenses start to fail, it is probably time for a new set of sunglasses anyway. Transitions Lenses come in several tint options. 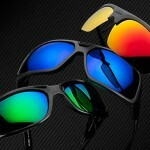 Transitions offered to send a pair of sunglasses featuring their adaptive lenses for testing. I opted for the Clear to Black Iridium Transition Lenses in the Oakley Fast Jacket frame with the hope that they would be my “go-to” pair in all conditions. My current sunglasses came with Black Iridium polarized lenses. 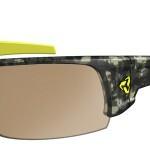 They are very dark and work well in bright sun but, being polarized, aren’t ideal for cycling. They also have a disadvantage as the skies darken or if I am mountain biking in the tree cover where light conditions are dim and constantly changing. These sunglasses are very comfortable to wear. 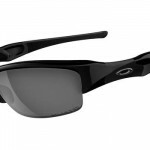 The Oakley Fast Jacket is comfortable and light-weight which makes them great for long days in the saddle. They are so light and comfortable, when combined with the Transitions Lenses which fade to clear when heading indoors, I actually forget that I am wearing them and forget to take them off. The optical quality of these lenses is superb. They provide a crisp, clear view with no obstructions from the frame. They offer great contrast, and a sharp image. There is no distortion in the lenses. The Fast Jacket offers wearers the option to use multiple lenses with one frame. The frames offer a unique lens retention system that, when compared to other models, does not require flexing the lens to remove it from the frame or install it back into the frame. They simply slide in and a small lever on either side of the frame locks the lens into place. This places less stress on the lens during the removal process. Interchangeable lenses also means you can own one frame but have several lenses for different conditions. this is especially handy if you want to carry a spare set of lenses with you as opposed to an entirely different set of glasses. I am very impressed with the adaptive lenses and believe they perform admirably in many situations where lenses with a static tint can fail. 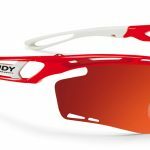 When riding in changing light conditions such as partly cloudy days or waning daylight they work extremely well. They are great for the local single-track where the trees filter the light and varied terrain creates a need for good depth perception and great contrast. they are also perfect for night riding as they achieve a level of crystal clarity in the dark that is perfect for providing eye protection while riding in the dark. 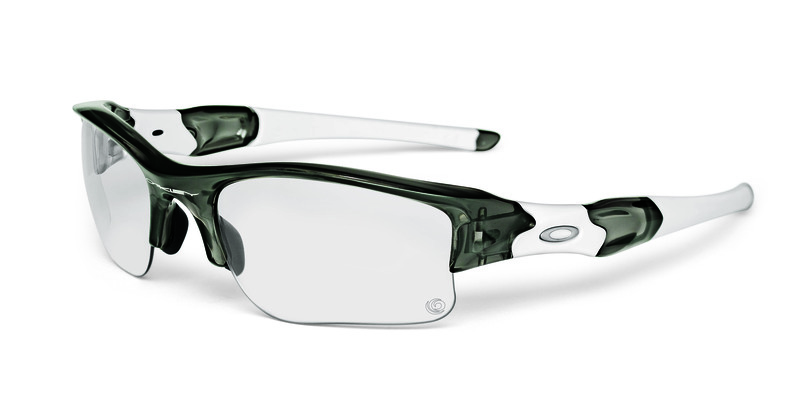 Oakley Flak Jacket Transitions Lenses. The lenses clear up when not exposed to UV light making them ideal for low-light and dark conditions. With a starting price of around $220 these glasses aren’t cheap but what you get is a high-quality frame and lens. Those who are looking for top-end optics and high-quality sunglasses will not be disappointed. These lenses will not darken fully while you are driving your vehicle. Automobile glass is made to block UV light, which is exactly what activates the photochromic cells in the lenses. Since there is very little UV reaching the lenses while in a vehicle, they won’t darken much. I found this out the hard way when driving into the setting sun and realizing that the lenses were not providing protection from the bright sun. These lenses are not a good choice for driving lenses so you will need to have a second set of lenses or sunglasses to use for driving. Transitions has addressed this issue with, Drivewear, a line of driving specific lenses which also respond to visible light, just just UV. I was hoping these lenses would eliminate the need for me to carry around multiple sets of sunglasses or lenses. Unfortunately, that is not the case. These sunglasses are great for most, but not all conditions. Where they fall short is on warm, sunny days and for use when driving. In both cases, the lenses fail to darken sufficiently to filter out the glare of the sun when compared to static dark-tinted lenses. As long as I was not directly facing the sun they were suitable but I found myself suffering from more eye-strain and was squinting more in the bright sun. As a result, on bright,warm, sunny days I find myself wearing my static-tint lenses when I know I will be in the sun for the duration of the ride. Just because they are not a “one-size-fits-all” solution doesn’t mean they are not a great option for riders. Even if you opt for a static set of lenses you are still going to find they don’t work in all conditions. These have become my “go-to” sunglasses for riding on cloudy days, at dawn and dusk, or when I know I will be riding into the dark hours after sunset. They are also perfectly suited for hitting the trails in the woods as they work well with the filtered light conditions. Previously, I had to give up on the sunglasses I was wearing for mountain biking because they were simply too dark and were not suitable for riding in the tree-cover, even on sunny days. These lenses are also great for riding in the cold winter months as the lenses have no problem achieving their darkest tint in cooler weather.